By Srinivas Chowdary Sunkara // petrobazaar // 1st February, 2019. As we predicted in our earlier commentary, In India, Industrial fuel oil prices edged up by 7.72 pct wef 01/01/2019, for the first half of the February across all the oil marketing company depots. 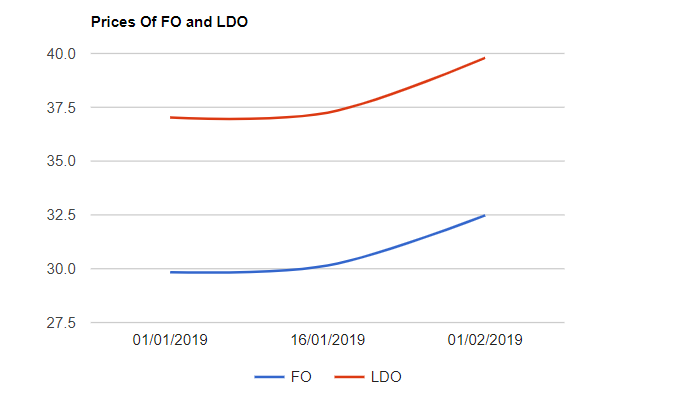 Furnace oil (F.O) and Light Diesel Oil (LDO) prices are increased on 1/02/2019 in line with a surge in global oil prices during the recent weeks. Furnace oil (F.O) prices are sagged down by 19.88 pct and Light Diesel Oil (LDO) prices nosedived by 17.79 pct since 16th Nov, 2018. As per the publications of oil marketing companies, At Visakha depo, Furnace oil prices are went up by Rs.2330/KL to Rs.32480/KL and LDO prices are up by Rs.2550/KL to Rs.39800/KL. In the Singapore market, IFO 180 cSt and 380 cSt graded fuel oil prices were flat where as no significant change is observed in local currency for last couple of days.